The colorful, sometimes stationary, other times sparkling and rapidly moving aurora has captured the human imagination for centuries. 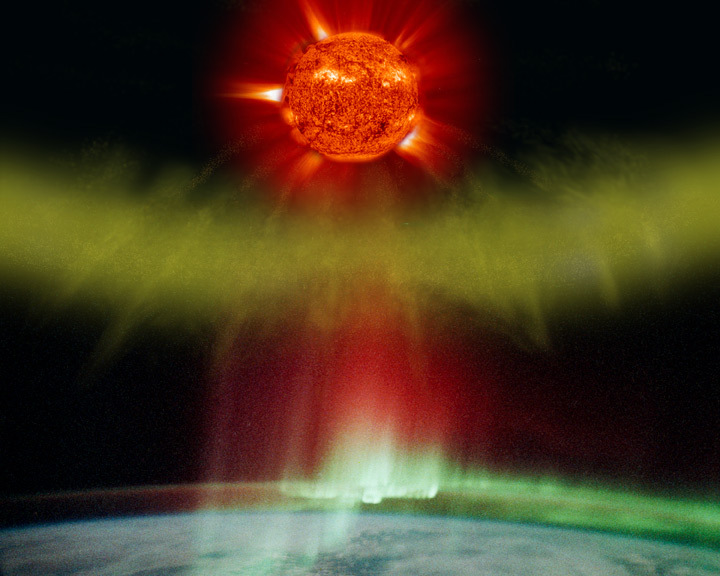 An aurora is emitted light in the neutral atmosphere. The light is created when charged particles precipitate into our atmosphere from the space environment. LASP scientists are working towards unraveling this intriguing environment. LASP scientists also study the physics of the solar wind and its evolution in space and time. Our local space environment is the result of the magnetic nature of the Earth, which is a large dipole embedded in the flow of the solar wind. Like a rock in a creek, the Earth’s magnetic field diverts the solar wind around the planet at a distance of about 10 Earth radii. This void in the solar wind is called the magnetosphere. The location of the boundary between the solar wind and the magnetosphere changes because of the pressure of the solar wind. The magnetic field from both the Earth’s intrinsic field and the plasma in the magnetosphere can also change the location of the boundary. The motion of wind flowing past the magnetic field creates currents and energy input into the magnetosphere, transporting the energy into our atmosphere. The Earth’s magnetosphere is studied at LASP on various levels. To understand the large-scale dynamics, simulations are developed and compared with observations from spacecrafts. Other types of studies focus on the dynamics and the creation of particles of a specific energy such as the high-energy particles that make up the Van Allen radiation belt. This region is important to study for the impact it has on human activities. The Radiation Belt Storm Probe mission, scheduled to launch in August 2012, will provide new information on this part of the magnetosphere. LASP researchers are also involved in other types of missions that orbit Earth, focusing on: atmospheric escape to space, large-scale energy releases in the magnetosphere, interactions between the solar wind and the magnetopause boundary, and plasma interactions with our upper atmosphere.